Stickers and iron-on patches with a means of transport theme. Product Description: Iron-on sticker (patch) with an embroidery of a small truck that is a concrete mixer.Content: 1 iron-on sticker.Dimensions: 30 x 45 mm. Max. length: 50 mm.Material: textile. 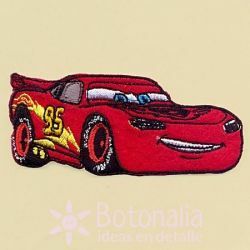 Product Description: Iron-on sticker (patch) with an embroidery of a small two truck.Content: 1 iron-on sticker.Dimensions: 40 x 45 mm. Max. length: 45 mm.Material: textile. 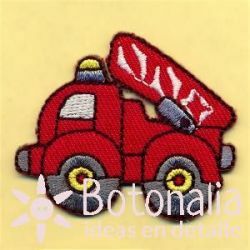 Product Description: Iron-on sticker (patch) with an embroidery of a little fire truck.Content: 1 iron-on sticker.Dimensions: 35 x 45 mm. Max. length: 45 mm.Material: textile. Iron-on sticker (patch) with an embroidery of a little trash truck in orange color.Content: 1 iron-on sticker.Diameter: approx. 50 mm.Material: Textile. 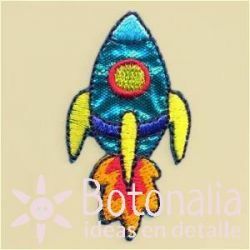 Iron-on sticker (patch) with an embroidery of a rocket in bright blue color.Content: 1 iron-on sticker.Diameter: approx. 50 mm. Material: Textile. Product Description: Iron-on sticker (patch) with an embroidery of a small bulldozer.Content: 1 iron-on sticker.Dimensions: 40 x 45 mm. Max. length: 50 mm.Material: textile. Iron-on sticker (patch) with embroidery of a sailboat. Perfect as a decoration children's clothes, school clothes and all types of fabric accessories. Dimensions: approx. 44 x 40 mm.Content: 1 iron-on sticker.Material: Textile. 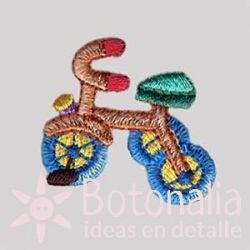 Iron-on sticker (patch) with embroidery of a colorful bike. Perfect as a decoration children's clothes, school clothes and all types of fabric accessories. Dimensions: approx. 40 x 35 mm.Content: 1 iron-on sticker.Material: Textile. Iron-on sticker (patch) with embroidery of a little train. Perfect as a decoration children's clothes, school clothes and all types of fabric accessories. Dimensions: approx. 40 x 32 mm.Content: 1 iron-on sticker.Material: Textile. 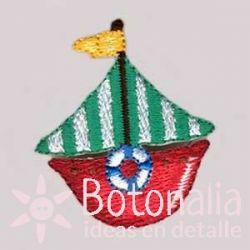 Product Description: Sticker (patch) with an embroidery of a farm tractor in green color. Content: 1 iron-on sticker. Maximum Length: 67 mm. Material: Textile.